As the Internet delivers ever-more specific search results and personalized content, we increasingly miss out on surprising connections. 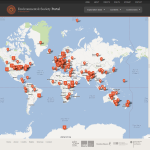 Our project, the Environment & Society Portal, offers something different: an exploratory experience that lets users visualize spatial, temporal, and thematic relationships. 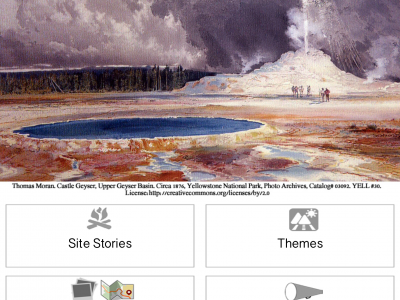 Since its launch in early 2012, the Portal provides an international community of academics, students, and the interested public with the opportunity to explore and discover free, openly accessible digital materials in the environmental humanities. 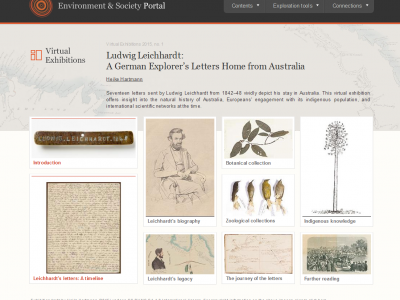 The Portal is the product of a small team at the Rachel Carson Center for Environment and Society in Munich, an institute funded by the German Federal Ministry for Education and Research for the purpose of building humanities connections internationally. 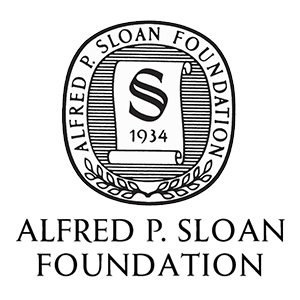 Our goal is to offer new ways of connecting issues, researchers, and the public in order to increase the field’s visibility and enhance its impact. We want users to come to the Portal not simply to find a particular item, but rather to “explore” their interest areas and serendipitously discover content with which they were previously unfamiliar. As it is neither possible nor desirable to present a “comprehensive” collection representing such a broad field, we instead envision the project as a dynamic, growing, and interactive “cabinet of curiosity.” To start, we have stocked this cabinet with a mix of new features and previously published materials that we think spark interest in the human-nature relationship or reflect on it as a field of knowledge. 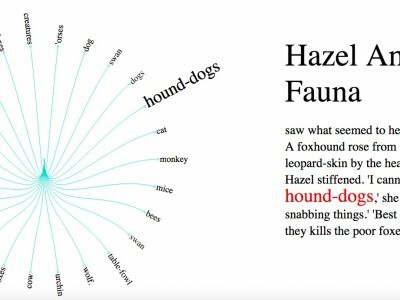 Curious users will encounter diverse content in many forms. In the Multimedia Library, they can listen to Jan Oosthoek’s recent podcast on Rachel Carson or watch the Seven Dwarves combat malaria in a 1940s animated film. Short descriptions of environmentally significant places and events populate the interactive Map Viewer, Timeline, and Keyword Explorer, allowing users to browse and visualize spatial, temporal, and thematic relationships. 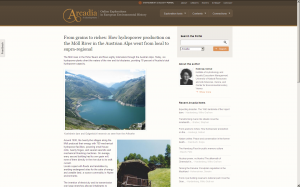 The Arcadia project, a collaboration with the European Society for Environmental History, presents illustrated and hyperlinked localized environmental histories. 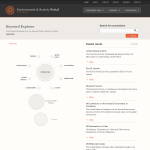 And the Portal’s media-rich online exhibitions feature in-depth contextualization of archival documents. 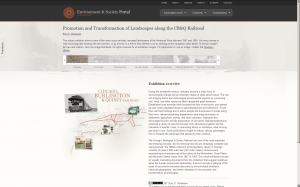 The first exhibition, Promotion and Transformation of Landscapes along the CB&Q Railroad by Madison’s Eric Olmanson is already one of the Portal’s most popular features and will soon be joined by exhibitions on the international impact of Rachel Carson’s Silent Spring; on diverse meanings of “wilderness”; on “Hazardous Chemicals”; and another on Alfred Wegener’s polar expeditions as described in his previously unpublished diaries. 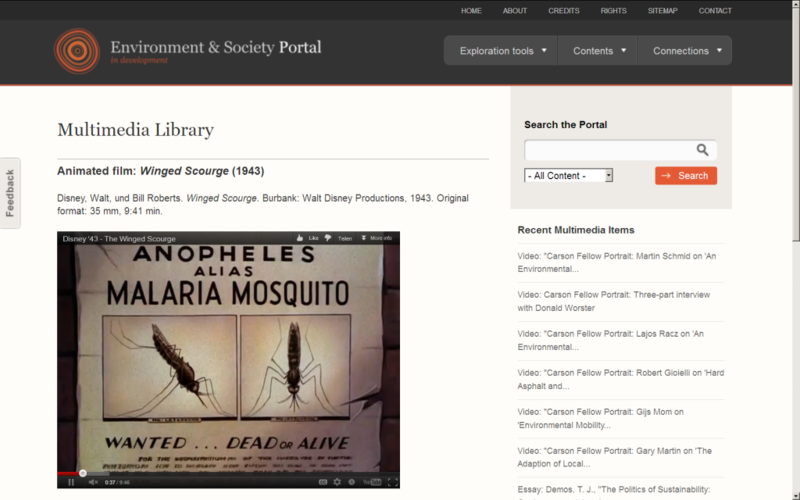 Thanks to feedback from our colleagues and user community, the Portal’s content collection is already growing rapidly and organically to incorporate a great variety of multimedia. With such diverse content, how can one create a platform for exploration and discovery? 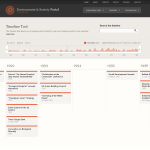 To do this, we have designed and built three interactive tools: the Map Viewer, which allows geographic browsing and discovery of “nearby” Portal content; the Timeline, which lets users search and visualize historical events in the Portal’s database; and the Keyword Explorer, which allows users to refine thematic searches. To fuel the tools, the team curates content with an eye to thoughtful and flexible expansion of data connectivity. To the extent possible, each item includes time, theme, and location metadata to exploit Drupal’s power to identify relations and connections, making content searchable and browsable through these interactive tools and helping users visualize connections among results. To drive the Keyword Explorer, for example, we created a flat controlled vocabulary of thematic keywords to encourage flexibility and to avoid predefining paths to results. As the Portal’s content grows, navigation experiences will evolve to reflect new relationships, links, and content clusters along diverse paths of exploration. Engagement of a strong online community is essential to the Portal’s success. As authorship and reliability are important to us, we invest in review and editing processes, and regularly engage specialists to create new features, to which we assign Creative Commons CC BY-NC-SA licenses to make it easier for users to translate, diffuse, and reuse the “born digital” content. We already encourage user feedback on each page and offer many options for content sharing via social media. New features in development include tools to create collections, create mash-ups with partner institutions, and automate references; user-generated content will soon be invited in certain controlled settings. By encouraging engagement from both the interested public and academic communities, the Portal will become increasingly dynamic, diverse, visible, and valuable. We hope that this platform will provide opportunities to rethink how we “frame” environmental humanities projects and encourage the formation of new connections.